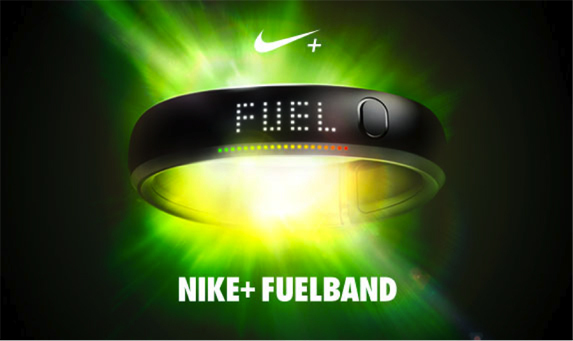 Nike+ FuelBand: statistics or marketing? You are here: Home / Curiosities / Nike+ FuelBand: real stats or just marketing? The Nike+ FuelBand uses the classic carrot-and-stick approach. Its colored LEDs light up when you reach your fuel goal. You also receive notifications in the accompanying iPhone and computer apps, where a little guy dances around and congratulates you on achieving various milestones. Your virtual awards are stored on a “trophy shelf” in the software. A competitor of the Nike+ FuelBand is the Fitbit, which clips onto your clothing and tracks your calories and steps — plus your “sleep efficiency,” whatever that means. Additionally, you can go online and log in calories consumed, thus obtaining a complete picture of your inputs and outputs. I haven’t tried the Fitbit, but it’s clear that the accountability and motivation offered by these devices are primary reasons to use either one of them. There have been days when I haven’t felt up to exercising, and yet I’ve still made myself get out and move — the FuelBand offers me a visual reminder that I need to stop sitting around. Personally, I’m glad the Nike+ FuelBand lacks Fitbit’s option to log calories consumed, because that would depress me when I filled it out, as well as a nag my conscience when I chose not to log my calories. It’s enough for me to get moving, and that’s what the FuelBand urges me to do. That’s why I applaud Nike’s marketing brilliance in creating the ideal “Just Do It” product — in the FuelBand, you wear something daily that reminds you to exercise. And what company are you likely to consider when you need more clothes or shoes to help you meet your fitness goals? How do YOU motivate yourself to get out and get moving? Let me know in the comments!